Francis Xavier Seelos was born in Fussen, Bavaria, Germany in 1819. He came from a large, loving Catholic family. He decided to become a priest and sail to the U.S. to minister to the German immigrants. This was a huge and generous sacrifice because he would be leaving his close-knit family almost certainly to never see them again until they were reunited in heaven one day. As a Redemptorist priest, he served at Saint Philomena church in Pittsburgh, where he made lifelong friends with the pastor, John Nuemann. John became bishop of Philadelphia and later the first man from the U.S. to be named a saint. This holy priest had a great influence on the younger Seelos. Father Seelos became a wonderful preacher, known for his cheerfulness, down to earth sense of humor, and great enthusiasm. He was an itinerant preacher, meaning he traveled around preaching missions. Later he served in Baltimore, Annapolis, Detroit, and finally New Orleans. In his final post, Father Seelos gave his all in caring for victims of a yellow fever epidemic. This caught up with the exhausted father and he fell victim to the disease at only forty-eight. Francis Seelos is declared blessed, the third of four steps on the way to Sainthood. His feast day is October 5. Francis Xavier Seelos was born on January 11, 1819 in Fussen, Bavaria, Germany. He was baptized on the same day in the parish church of St. Mang. Having expressed a desire for the priesthood since childhood, he entered the diocesan seminary in 1842 after having completed his studies in philosophy. Soon after meeting the missionaries of the Congregation of the Most Holy Redeemer (Redemptorists), founded for the evangelization of the most abandoned, he decided to enter the Congregation and to minister to the German speaking immigrants in the United States. He was accepted by the Congregation on November 22, 1842, and sailed the following year from Le Havre, France arriving in New York on April 20, 1843. On December 22, 1844, after having completed his novitiate and theological studies, Seelos was ordained a priest in the Redemptorist Church of St. James in Baltimore, Maryland, U.S.A.
His availability and innate kindness in understanding and responding to the needs of the faithful, quickly made him well known as an expert confessor and spiritual director, so much so that people came to him even from neighboring towns. 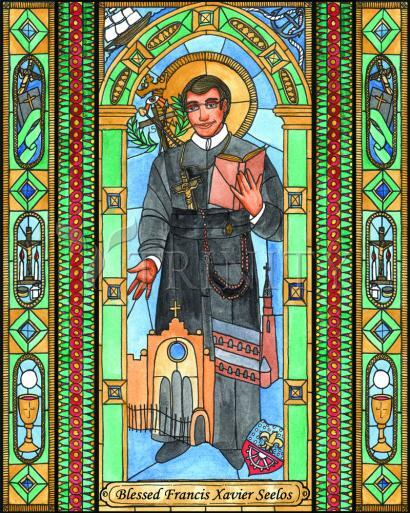 Faithful to the Redemptorist charism, he practiced a simple lifestyle and a simple manner of expressing himself. The themes of his preaching, rich in biblical content, were always heard and understood even by everyone, regardless of education, culture, or background. A constant endeavor in this pastoral activity was instructing the little children in the faith. He not only favored this ministry, he held it as fundamental for the growth of the Christian community in the parish. In 1854, he was transferred from Pittsburgh, to Baltimore, then Cumberland in 1857, and to Annapolis in 1862, all the while engaged in parish ministry and serving in the formation of future Redemptorists as Prefect of Students. Even in this post, he was true to his character remaining always the kind and happy pastor, prudently attentive to the needs of his students and conscientious of their doctrinal formation. Above all, he strove to instill in these future Redemptorist missionaries the enthusiasm, the spirit of sacrifice and apostolic zeal for the spiritual and temporal welfare of the people. In 1860 he was proposed as a candidate for the office of Bishop of Pittsburgh. Having been excused from this responsibility by Pope Pius IX, from 1863 until 1866 he dedicated himself to the life of an itinerant missionary preaching in English and German in the states of Connecticut, Illinois, Michigan, Missouri, New Jersey, New York, Ohio, Pennsylvania, Rhode Island and Wisconsin. After a brief period of parish ministry in Detroit, Michigan, he was assigned in 1866 to the Redemptorist community in New Orleans, Louisiana. Here also, as pastor of the Church of St. Mary of the Assumption, he was known as a pastor who was joyously available to his faithful and singularly concerned for the poorest and the most abandoned. In God’s plan, however, his ministry in New Orleans was destined to be brief. In the month of September, exhausted from visiting and caring for the victims of yellow fever, he contracted the dreaded disease. After several weeks of patiently enduring his illness, he passed on to eternal life on October 4, 1867, at the age of 48 years and 9 months. His Holiness Pope John Paul II, proclaimed Father Seelos Blessed in St. Peter's Square on April 9th of the Solemn Jubilee Year 2000. His Feast Day is October 5.